I can't believe this is my 91st post. Wow, that sure went fast. I guess I need to start thinking about a fabulous giveaway for my 100th post. I love giveaways, don't you? Yesterday morning I spent a couple hours at the Goodwill Outlet. I can't say that I found as many exciting treasures as last time, but I still found some good stuff. I threw most of it in the wash before I got a chance to take a picture, but I found a neat duvet cover for my daughter, an old light green chenille bedspread, pretty much a cutter, but will be good for projects, some miscellaneous vintage linens with their garage sale stickers still attached, a couple pair of shorts overalls (project in mind for farm chicks), and this stuff. 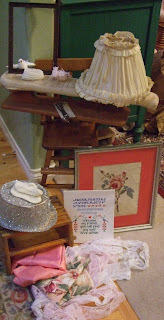 A little wood doll high chair, wood step stool, funny glittery part hat and old ironing thingy, rose needlepoint picture, old lamp shade , old frame, little white birdy, some little sparkly flowers, baby slippers, needlepoint sampler, lace, rick rack, pink satiny fabric and some floral chintz fabric. Grand total for all of this stuff, plus what's in the washer soaking, $25.00. Gotta love the Goodwill Outlet! Remember the wedding veil I got the other day at the Deseret shop? Well, I gave it a little tea bath on the stove and look how cool it turned out. 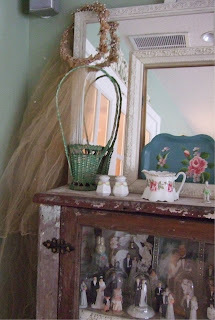 Right now it is hanging on a frame over the cabinet where my vintage wedding topper/other wedding stuff hangs out. I will most likely sell it, but maybe it can hang here for a while. Later today we are heading over the mountain to go visit my in-laws for the weekend. It will be good to see them and just hang out and relax. I'm sure they will have a warm and toasty fire in the woodstove upon our arrival. Ahhh! LOVE the wedding display you have there!! Some lovely finds from the goodwill, oh I do love a good treasure hunt! Hi Lisa! Too funny... I just bought a piece of the same chintz fabric from VV this week. I'm going to make some handbags with it. Maybe I should start posting my thrift finds too.... The veil looks pretty hanging from your mirror! I love that little high chair! Just bought one for my niece at an antique shop and paid $25 for it...hmmm. Also, I think the ironing thingy is for ironing just the sleeves. Great deals!!!! No, I'm not over TV I'm afraid. Lost started and I am sucked right back in. Well, American Idol, too. Love your new "stuffses" as always. I love the wedding toppers you have! Hope your trip was enjoyable!! Those were some great finds!! It seems like everyone else's Goodwills are so much better than ours. It's rare I'd find any one of those things at our thrifts, much less that cheap. You done good, hun. What a Fun Wedding Display. I Love Playing at Goodwill, I got to go There today too, But Not to many Treasures. Just telling Mac you find so many neat things at the Good Will...I haven't been in one in years, really have to go to Charlotte and see what I can see! You've inspired me girl...soon as the side effects wear off, it's off I'll go!!! I just added you to my "Favorite Pages I enjoy visiting list...I hope you don't mind! What great finds, I love goodwill. Never know what you are going to find It is always an adventure there. You hit the jackpot again.....lots of great finds. Love your collection of bride and grooms and the veil looks very pretty with them....I'd keep it for awhile too. I love your goodwill treasure, I wish our charity shops over here were half as good! hello over there...Such a beautiful, lovely blog you have!! I've been given a little blogging award, along with the responsibility to pass it on. Since I have a passion for roses -- especially pink roses -- I was delighted to find your blog. So, please stop by mine and pick up your award.